South Dakota Gov. Kristi Noem on Wednesday signed a package of bills aimed at curbing abortion. 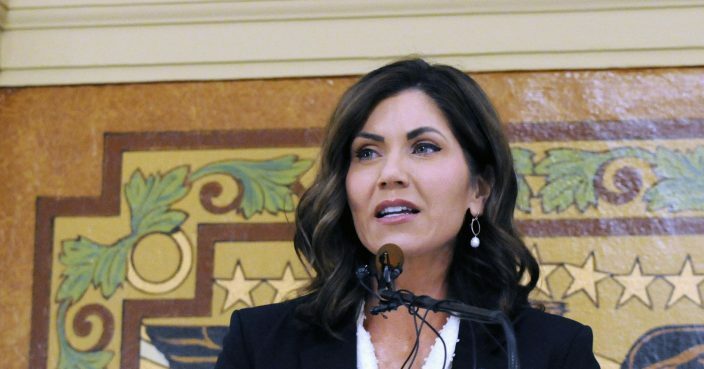 Noem said the bills will "crack down on abortion providers in South Dakota" by requiring providers to use a state form women must sign before they can end a pregnancy. "A strong and growing body of medical research provides evidence that unborn babies can feel, think, and recognize sounds in the womb. These are people, they must be given the same basic dignities as anyone else," Noem said in a statement. Another new law will require doctors to give a woman an opportunity to view a sonogram and hear the heartbeat of a fetus before an abortion. Another bill criminalizes causing an abortion against a woman's will. Groups opposing abortion praised the Republican governor. "In signing these pro-life bills that had broad legislative support, Governor Noem has demonstrated once again that she is a champion for life," Dale Bartscher, executive director of South Dakota Right to Life, said in Noem's news release. But Sarah Stoesz, president and CEO of Planned Parenthood North Central States, says South Dakota lawmakers spent "precious taxpayer resources" on bills that unnecessarily restrict a woman's access to a safe, legal abortion, the Argus Leader reported. "The state has already squandered hundreds of thousands of dollars in litigation fees fighting for medically unnecessary abortion restrictions," Stoesz said in a statement. "The people of South Dakota want their lawmakers to focus on improving the health of our state; instead, they've passed more legislation that's based on medically inaccurate information and contrary to the recommendations of health care professionals." Planned Parenthood runs South Dakota's only abortion clinic.